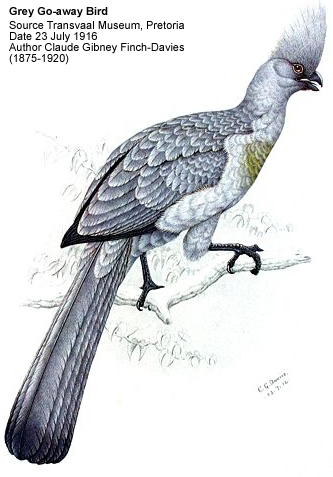 The Go-away-birds, Corythaixoides, are a genus of bird in the turaco family (Musophagidae). In Southern Africa these birds are known as louries. The go-away bird gets its name from its well-known call: a harsh "kay-waaay," which warns other birds of danger. Unlike many of the brighter forest-dwelling turacos, these are birds of African open country and have drab grey and white plumage. In the wild, the bird spends most of its time perched in small groups.